This company’s magic is their luggage FastPass® System. It allows travelers to unzip a specialized electronics compartment, lay the bag flat on airport TSA conveyer belts, and zip through security without having to unpack laptops, tablets, and cables. I use the Hercules Laptop Backpack and Falcon Wheeled Duffle Bag. Use voucher code: MAGSTRAVELS for a 15% discount. Never lose your luggage. This tag has a microchip embedded with your contact information. Airports worldwide can track your bag at all times, which means no more lost luggage. YAY! The tag also has a QR code printed on the back. 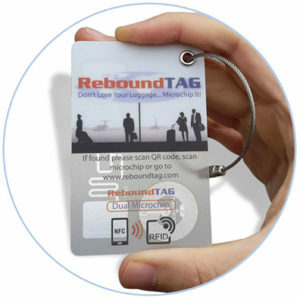 This lets anyone with a smartphone scan your bag should they find it outside an airport. Use voucher code: MAGSTRAVELS for a 10% discount.